I know it's already WEEKS since Valentino show at Paris Fashion Week. So, I understand if some of you who (probably) read my blog feel disappointed. Please blame my laziness. I'm a super lazy blogger and I don't deserve any reader. *How dare you dreaming to be a super fashion blogger. 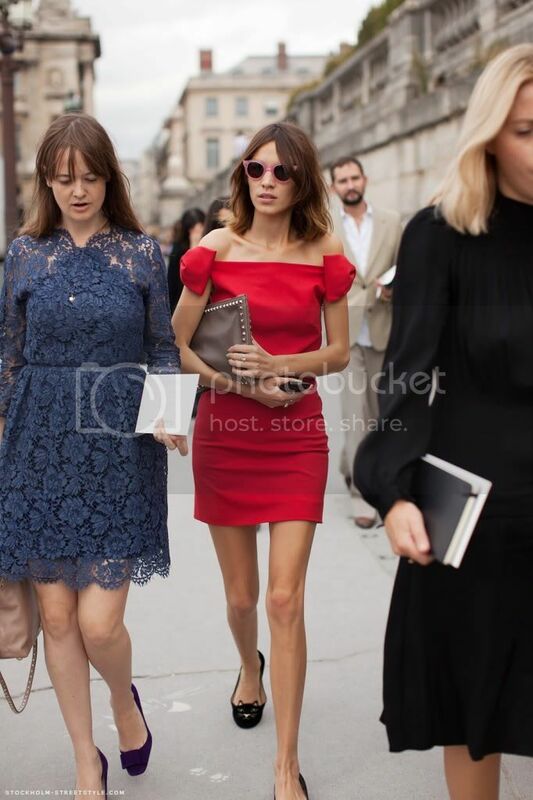 Thanks to Alexa Chung. She really makes me want to write again. (Sounds like I've known her for years, eh? Hehe..) Though it's a little too late. But hey, inspirations never come too late. When I first saw Alexa's on Stockholm Streetstyle, I was like "Alexa! (..then) THE SHOES!". Yeah, the things that really really attracted me were the shoes she wore. They're the cutest pair I've ever seen and she styled them so well. Imo, there's no one out there who can pull this look better than her. No doubt. What she was wearing are a red Valentino dress (I love the bow details on the shoulders), a Valentino oversized rockstud leather clutch, and Charlotte Olympia Kitty embroidered velvet flats (you can buy them here). Who doesn't agree that Alexa Chung is a true inspiration? Finally, my first post after months of hiatus is finished. Hopefully you (if there's someone out there is reading) have a nice weekend. Ta-ta! She's one of my favorite fashion icon! I'm now following you via GFC and I would love a follow back, darling. Any plan on Halloween? What are you dressing up as? I just made an Alexa Chung mini book full of illustrations of miss chung! The cover is featuring her wearing the same dress! Ohhhh, I so love Alexa and Valentino - that dress is perfect. Great post! !